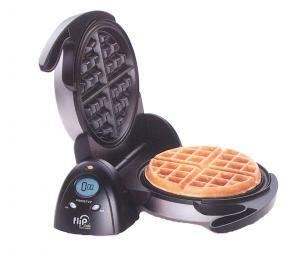 This professional style waffle maker features a rotating design that bakes extra thick Belgian waffles in minutes. It flips 180 degrees to evenly spread the batter for waffles that are crispy outside and tender inside. An extra thick grid makes a 7 inch diameter waffle with four easy to cut sections.